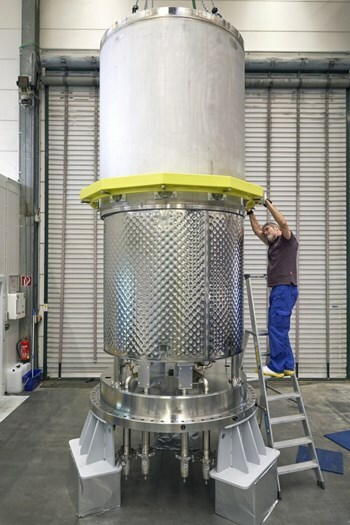 Standing 3.4 metres tall and weighing eight tonnes, the pre-production ITER cryopump cuts a striking figure as it waits for final assembly in the laboratory of the German company Research Instruments. But it is not its imposing size that makes this pump unique, it is the technology inside. 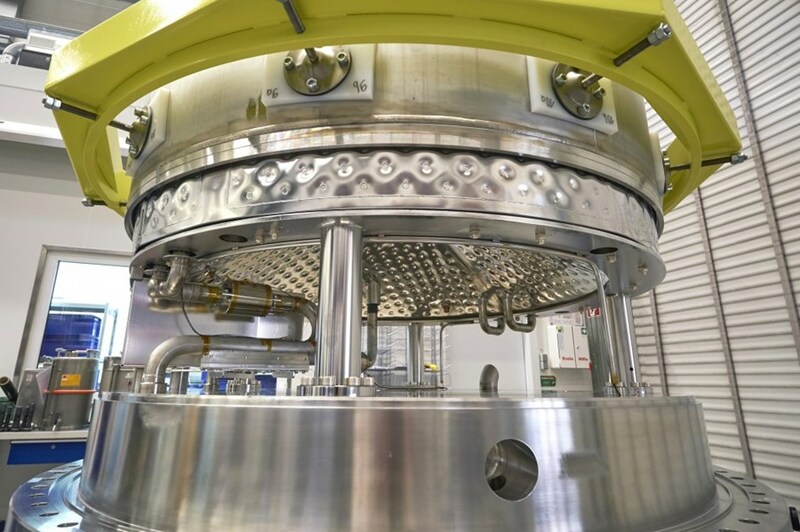 In order to maintain ultra-high vacuum inside the ITER vacuum vessel during operation and to evacuate residual gas from the fusion reaction, a 200-kilogram valve has to move along a 1.8-metre-long shaft and lock in about ten seconds with a precision of 0.1 mm to tighten the all-metal seal that is required for the radiation environment. All this faithfully ... over the more than 30,000 cycles of the machine's lifetime. The complex pumps have been tailored for the very specific applications and requirements at ITER. All are based on cryopanels, cooled with supercritical helium and coated with activated charcoal as sorbent material. Research and development has shown that charcoal from finely ground coconut shells has the right density and porosity for imprisoning the gas particles in ITER. In total, six cryopumps will be installed around the ITER vacuum vessel. Like a synchronized ballet they will pump and rest in turn, guaranteeing continued gas evacuation during plasma discharges. While four of the six pumps will always be on duty, the other two will be separated from the vacuum vessel and given 10 minutes to regenerate. This is a necessary step, because over the long plasma pulses ITER is designed for (up to 3,000 seconds), the accumulation time of hydrogen to the charcoal-granule absorber panels inside the pumps has to be limited for safety reasons. During their "regeneration phase," the pumps will be disconnected from the torus vacuum system. The cryopanels inside the pump will be "heated up" (away from their cryogenic operating temperature of 4 K) to 100 K, permitting the release of hydrogen that has been accumulating on the charcoal-granule coating. Then the torus cryopump will be connected to a roughing pump to extract the hydrogen and send it back to the Tritium Plant, where the precious fuel will be recycled. Thus regenerated, the pump will be cooled back down to its cryogenic temperature again and return to join the band of six. This week, the pre-production cryopump will travel to Pro-Beam in Berlin where the pump plug will be welded to the casing, and assembly activities will be completed for the valve unit. Once finalized, the whole assembly will be delivered to the ITER Organization for the installation of the valve control system and vacuum gauges and for final acceptance tests.